Lift the lid while pulling up the lever to release the lock. Slide the console box lid forward as needed. Slide the lid forward while pulling up the lever. The lid can also be opened from the forwardmost position. ■Caution while driving Keep the console box closed. 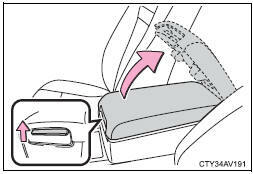 In the event of sudden braking, an accident may occur due to an occupant being struck by the open console box or the items stored inside.